Sometimes a kitty companion can help if your little one is lonely. While many people think of cats as loners, the truth is that your cat forms a close bond with you and enjoys your company. Spend time with your kitty when you can, and consider adopting a feline friend for her so she won't get lonely during the day. While it's true that cats spend the majority of their time sleeping, when they're awake they love to play and spend time with you. They look to you for companionship and without it they can actually become depressed. A lonely, depressed kitty can become lethargic and lose her appetite. She can also become obese, eating too much and failing to move around as much as she should. The existence of a cat is pretty bleak if she's left alone with no mental or physical stimulation for prolonged periods. For severely depressed kitties, mental condition can affect physical condition and even require veterinary care or the use of prescription antidepressant medications. Without you around, your kitty may become bored and find unacceptable ways to relieve her boredom, like scratching the furniture or other destructive behavior. Make her environment a fun, interesting place to be, even while she's alone. Place toys and scratching posts around the home, and give her cat trees to climb. Window perches allow her to observe the outside world. Leave a DVD designed for cats on automatic replay during the day for her to watch. These are available in pet supply stores, and usually contain footage of birds or squirrels to keep your kitty's attention. Another option is to purchase a fish tank and fill it with fish to fascinate your kitty—just make sure it has a cat-proof lid. 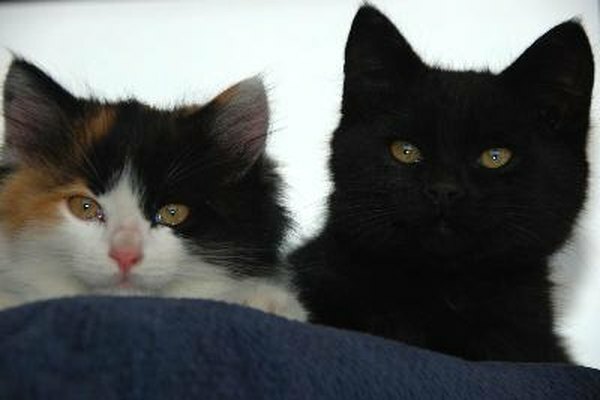 If you're gone during the day for long periods, you may want to consider adopting another cat to keep your existing feline company. Younger cats tend to adjust to the addition of another cat more readily than older ones, enjoying having a buddy around to play with. Choose a cat around the same age, who has a similar personality to your kitty, so that they'll be more likely to get along with each other. Have each of your kitties spayed or neutered, to prevent unwanted litters and behavioral problems. You'll still want to enrich your kitties' environment—after all, two bored kitties can get into far more trouble than one. Spend time with your kitty to prevent loneliness and to bond with her. Engage her in interactive play for 15 to 20 minutes each day to keep her mentally and physically active, recommends the Longmont Humane Society. This will also reduce the chances of her becoming obese. Consult with your veterinarian if you notice that your cat appears depressed or lethargic, as this could indicate a medical issue, rather than simply loneliness or boredom. Considering a feline companion for your furry buddy? Adopting another kitty is a serious commitment, requiring medical care, food and attention for his entire life. If you feel that you have the resources to support another pet, a feline friend for your kitty could be just the thing to keep her active and relieve her boredom when you aren't there with her. Cat Channel: Do Cats Get Lonely If Left Home Alone All Day? PetPlace: I Have a Lonely 11-Week Old Kitten—Should I Get Another Cat? PetPlace: Should I Get Another Cat?